A virtual kitchen game where children prepare and cook meals for three very hungry guests. 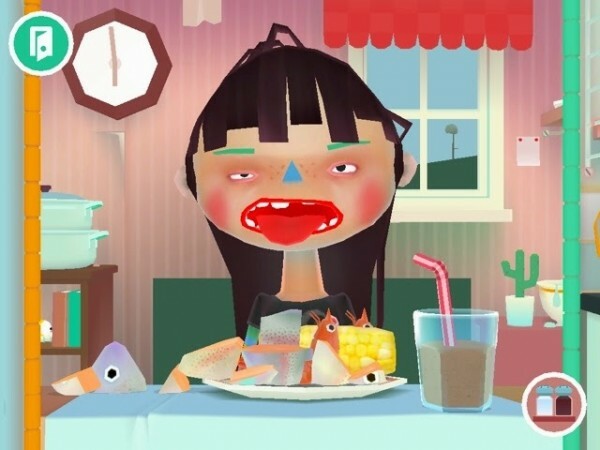 Toca Kitchen 2 comes from the award-winning Swedish studio Toca Boca (the name means “touch mouth” in slightly ungrammatical Spanish). 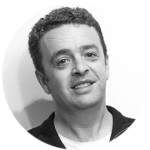 Though designed for children aged 3 to 6, the appeal of this app is broad and it’s quite possible for older children – and, ahem, some fathers – to enjoy Toca Kitchen 2 as well. Toca Boca describes this app as a “digital toy”, and so the emphasis is on free play rather than achieving game objectives. This means that there is no scoring, no winning or losing, and no game levels to work through. the game is controlled completely by touch screen. At the left of the screen you can access a fully stocked pantry containing fruit and vegetables (including one very odd-looking blue fruit that resembles Haley’s Comet), bread, fish, and meat. A vegetarian option is also available for families that way inclined (such as ours). Flick to the bottom of the screen and all your seasonings and condiments pop up. Pick up your virtual knife to slice and dice your ingredients. Flick to the right to open a menu for different cooking methods including pan-frying, deep-frying, roasting and a blender. Finally, plate up your dish and wait to see your guest’s reaction at your latest culinary creation. Another thing I like about this app is that the play is open ended and player driven. In Toca Kitchen you’re exploring an engaging virtual environment rather than just responding to stimuli thrown at you by the mechanics of the game. It really seems to me that our son can play this game without getting hyped up, as he sometimes does after playing even relatively gentle arcade games like Fruit Ninja. And finally, the design of Toca Kitchen is top notch, from the vivid, cartoonish characters to the refreshingly unobtrusive soundtrack, which consists mainly of cooking sound effects and the guests’ Muppet-like nonverbal exclamations. Similarly, the colour palette is bright enough to provide contrast but not so glaring that it tires the eyes. Those Swedes really know their design, don’t they? There’s not much to complain about this game. Perhaps the only reservation I would make is that some children might find the free play aspect of the game somewhat aimless, lacking as it does clear objectives and rewards. 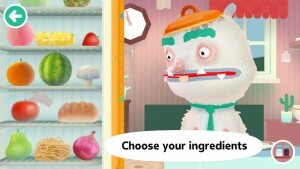 Toca Kitchen 2 is an excellent app for younger children. Full of cheeky good humour, children will delight in the slightly transgressive fun of making a mess in the kitchen, while parents can enjoy this spectacle from a virtual distance without the inconvenience of having to clean up afterwards.